FC61 in the Hyperflow of History. 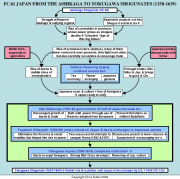 The Ashikaga shoguns who took over in 1338 found themselves faced with many of the same problems that had led to the downfall of their Hojo predecessors, namely resistance from outlying regions of Japan and continuing turmoil caused by bandit samurai (ronin). In addition, two other things weakened the Ashikaga government. First of all, the emperor Godaigo, rather than remaining a shadowy figurehead, challenged the Ashikagas for power. Although he was defeated, his revolt further weakened the shoguns. Secondly, the Ashikagas engaged in expensive building projects that cut into their already diminishing tax and estate revenues. As a result, many constables, the shoguns' officials in the provinces, started assuming more power locally, further weakening the central government. This triggered revolts and the assassination of the shogun in 1441. A regency of four competing houses followed, which only led to more feuding and the Onin War (1467-77). Although a settlement was patched up, the damage was already done, and a period known as the Age of Warring States ensued, dominated by new provincial warlords known as daimyo. The turmoil of the age created a good deal of social upheaval, which allowed many ambitious men of lower class origins to rise to positions of power. (Among these would be Toyotomi Hideyoshi, a peasant who would eventually unify Japan under his rule.) Contributing to the era's social mobility was the introduction of European muskets in 1542. This created a greater reliance on peasants for the daimyos' armies, some of which had three peasants in the ranks for every samurai. Another impact of the age's upheaval was declining status for women. This was largely the result of wider enforcement of primogeniture in order to prevent the splitting of family estates in these dangerous times. Therefore, women lost most of their property rights and became little more than pawns in the power politics of the day. The roughly 142 daimyo who controlled Japan at this time were virtually independent rulers who fought each other viciously for survival and power. For about a century, rival daimyos plundered towns, devastated the countryside, and massacred innocent civilians. However, many or most daimyo also saw that a healthy society was essential to their power. Therefore, they closely supervised their estates and encouraged economic improvements, especially through public works such as irrigation projects. This helped create more settled conditions, which had three major results. First of all, much like in Western Europe, the more settled conditions along with improvements in agriculture, led to the rise of towns. These generally started as markets under the protection of the daimyo's castle walls and then grew into full-fledged towns with a middle class of moneylenders using both cash and credit. Second, the more settled conditions and a desire for trade combined with a growing problem with Japanese pirates, known as wako, combined to make Japan more open to trade and relations with Portuguese explorers who were then first entering East Asian waters. This was because wako raids on the mainland had caused the Ming dynasty in China to cut trade relations with Japan. The Japanese, who were especially anxious to get silk from China, saw the Portuguese, who could trade in China, as useful middlemen to that end. In addition to trade, two other very different things came into Japan with the Portuguese. One was the manufacture and use of firearms in warfare, which spread rapidly across Japan. The other influence was Christianity, which was spread by Jesuit missionaries who displayed great self discipline and concentrated on the upper classes, both of which features the Japanese samurai liked. As a result, many samurai and even daimyos converted to Christianity. Both firearms and Christianity would later lead to growing stresses in Japanese society. Another effect of the more settled conditions then prevailing was a cultural flowering in Japan. This largely centered on a new Buddhist sect known as Zen. Up to this point, the most popular form of Buddhism was Amida, or the Pure Land, sect. Unlike Theraveda Buddhism, whose members thought that it took personal effort to attain Nirvana, the extinction of the self which they felt was an illusion anyway, Amida Buddhism's followers saw Buddha and the Bodhissatva (other mortals who had gained enlightenment) as deities who would help them reach a paradise to the West. While this paradise was originally meant to be merely a sort of halfway spot where people could attain final enlightenment, many people saw it as an end in itself. Amida Buddhism came to resemble Christianity in several ways. For one thing, it based salvation on God's grace. Second, it conceived of Buddha as something of a Trinity in the doctrine of the Three Buddhas: the body of Essence, who was the primordial Buddha pervading the universe, the Created Body, which was the historical Buddha much like Christ, and the Body of Bliss which takes the form of many Buddhas. The most important of these is Amida Buddha (Immeasurable Glory) who dwells in the Western paradise. Also, like Christianity, Amida Buddhism concerned itself with good works and charity. By the fifteenth century it was the most popular form of Buddhism in Japan, and it has kept that distinction to this day. However, by this time another form of Buddhism, Zen, was becoming especially popular with the Samurai. Zen, which had reached Japan in the sixth century, emphasized reliance on one's own efforts rather than the grace of Buddha to attain enlightenment. As a result, it never achieved the popularity of Amida Buddhism. The basic idea of Zen is that there is an underlying unity tying everything together; but we are trapped in our daily perceptions by the illusion of a distinction between ourselves and the world around us. The goal of Zen is to be able to perceive the reality of that unity and extinguish our egos that create the illusion that separates us from all around us. This is not done through rational means, since rational thought is the product of minds that still perceive a subjective and objective world where things are separate from one another. Rather, Zen strives for enlightenment ( satori) through an intuitive grasp by means of meditation and concentration. There are two primary techniques to this end. One is the koan, which from the rational point of view is an illogical riddle or theme that is meant to break the mind's customary thinking and "derail" it from its normal rational patterns of thought. The strain that the koan puts on the conscious mind should liberate the subconscious and break down the barriers between the two, thus leading to enlightenment. The second technique is zazen, a strict meditation using proper posture, breath, and concentration that stills the mind, controls the emotions, and strengthens the will. Unlike the koan, which through its "illogic" suddenly shakes one into enlightenment, zazen generally attains a more gradual enlightenment. However, zazen was more popular with the samurai, since its emphasis on discipline helped them develop their military skills, while its ideas on life and death (which in Zen are one and the same) helped them face death in battle with more resolve. Not surprisingly, such martial arts as swordsmanship and archery came to be closely associated with Zen, a far cry from Buddha's original intentions. Zen, with its emphasis on harmony, purity, tranquility, and simplicity, had a profound impact on several aspects of Japanese culture during this time. One was the tea ceremony, which had also been imported from China several centuries earlier. This ritual, where one person served tea to another, took place in a simple hut and emphasized simplicity through the precise arrangement of objects and the equally precise motions in the ceremony itself. Ceramics and flower arranging, which were inherent parts of the tea ceremony, also became important aspects of Japanese culture at this time. Zen also influenced the development of Japanese gardens, and in particular rock gardens of raked gravel (to represent the tranquility of the sea) interspersed with larger rocks arranged in precise and asymmetrical patterns. The beauty and simplicity of these gardens were designed to help one in meditation. Although these various cultural advances were not of a political nature, they did help provide Japan with a common culture that promoted the unity of Japan as a whole. At the same time, the rising towns and middle class along with the spread of firearms and Christianity were available for anyone with the daring and foresight to exploit them in the reunification of Japan. That person, Oda Nobunaga, came to power in a relatively obscure but strategically placed province of Owari in 1551. He and his successors, Toyotomi Hideyoshi and Ieyasu Tokugawa, would restore unity and order to Japan. Nobunaga was a cruel and ruthless tyrant who once had a maid executed for leaving a fruit stem on the floor. However, he was a skillful general and ruler who successfully exploited the forces of the day to his advantage. He was a leader among Japaneses daimyo in adapting firearms to his army and using them to great effect. He also built his economy by building roads, abolishing tolls, and establishing open markets and a standard coinage. One other thing Nobunaga did was favor the Christians against the militant Buddhist monasteries that he especially disliked. Success bred success for Nobunaga, since each victory attracted more followers to his standard, which led to more victories and so on. By his death in 1582, Nobunaga controlled 32 of Japan's 66 provinces. It was left to his successor, Toyotomi Hideyoshi, to complete Japan's unification. Hideyoshi was originally a peasant who had risen through the ranks to become one of Nobunaga's most trusted generals. Like Nobunaga, he was also a superior general, being both bold and resolute in action. Although not quite as cruel as his predecessor, he could still be ruthless as he avenged Nobunaga's death, eliminated any rival generals who might make a bid for power, and got Nobunaga's lands under his control, By 1590, Hideyoshi had unified all of Japan except for the lands of Ieyasu Tokugawa with whom he concluded a treaty that lasted until Hideyoshi's death in 1598. Hideyoshi declined to assume the title of shogun since he was not related by blood to the current line of shoguns. Once Hideyoshi's power was established, he followed three policies that would profoundly affect Japan's future course of development. For one thing, he launched two invasions of Korea (1592 and 1597). Both of these failed, largely due to the Korean navy of armored "turtle" ships that cut the Japanese army in Korea off from its homeland and forced its retreat. Despite these defeats, one can see this as part of a greater expansion of the Japanese people, going along with the spread of Japanese settlers, mercenaries, and pirates (wako) throughout East and Southeast Asia. Secondly, despite his own peasant origins, Hideyoshi cracked down on society in an attempt to stifle the social mobility that had helped stir up so much turmoil over the past century. In an attempt to disarm the populace, Hideyoshi launched the Sword Hunt, confiscating all weapons, especially firearms, from non-nobles under the pretext of melting them down to make a statue of Buddha. He also prevented peasants, merchants, and samurai from changing their professions or even their overlords, thus creating a rigid social structure that lasted until the mid 1800's. Hideyoshi's third policy concerned growing tensions with European Christians, whose ability to trade with China had greatly increased their influence in Japan. As we have seen, the Japanese liked the Jesuits whose self-discipline and habit of preaching mainly to the upper classes did little to disrupt the harmony of Japanese society. However, several things about Christianity disturbed many Japanese: their meat diet (since the Japanese were mainly vegetarian), their intolerance of other religions, their slave trade which took Japanese out of their country, and the question of who Japanese Christians were more loyal to, their own rulers or the Christian God. In 1587, after one of his vassals refused to renounce Christianity, Hideyoshi decreed all Christian missionaries should leave the country. However, the decree was not strictly enforced, and missionaries just kept a low profile as they did their work. Tensions increased in 1593 with the arrival of Spanish Franciscans who raised suspicions of trying to stir up rebellion by preaching to the lower classes. A dispute over ownership of a Spanish galleon shipwrecked off the coast of Japan in 1596 led to fears of a Spanish invasion and persecution of Japanese Christians. Hideyoshi's death in 1598 led to a power struggle which ended with the new ruler, Ieyasu Tokugawa, establishing his power and even assuming the title of shogun. During this time, problems with the Christians were put on hold. However, in 1600, Dutch Protestants arrived who told stories about their Spanish enemies that revived Japanese fears of all foreigners. As a result, Tokugawa outlawed and persecuted Christians. His successors went even further, banning virtually all foreigners from Japan by 1639. Only two Dutch ships and a handful of Chinese and Korean ships could trade each year. For the next two centuries, Japan would cut itself off from the rest of the world and develop on its own.